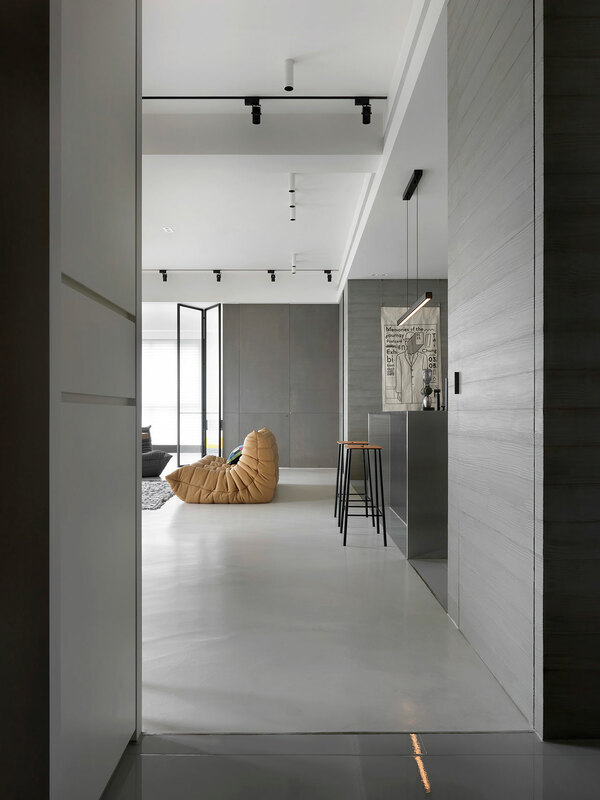 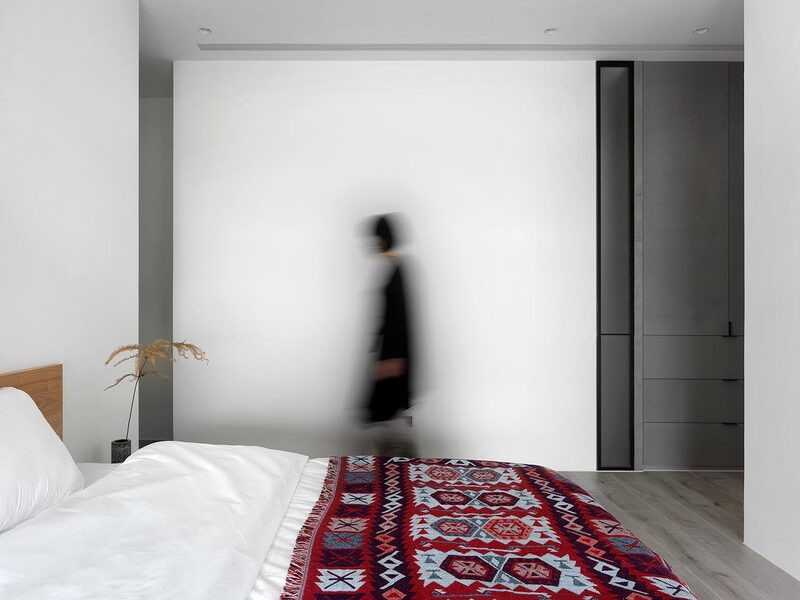 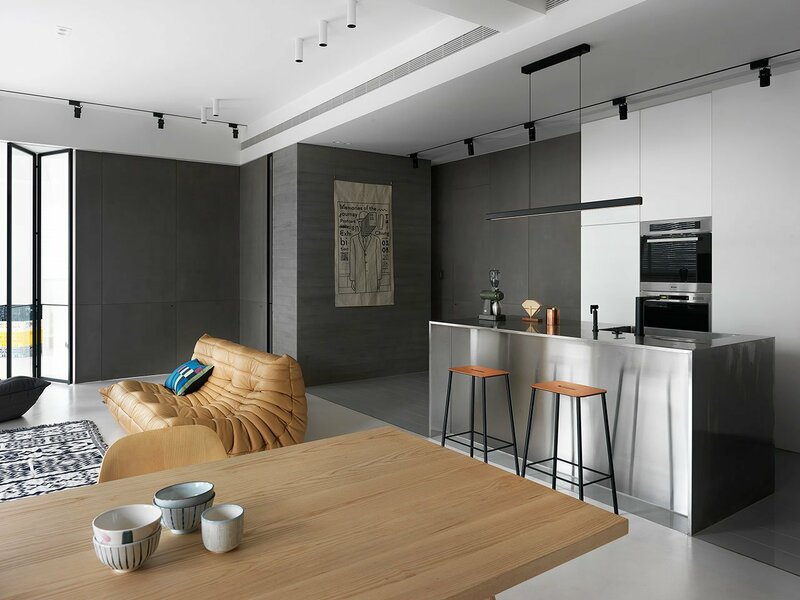 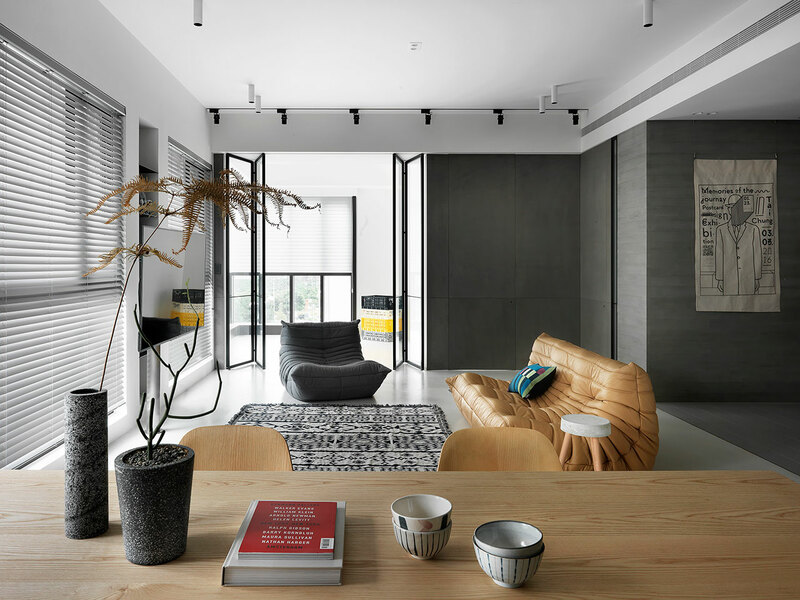 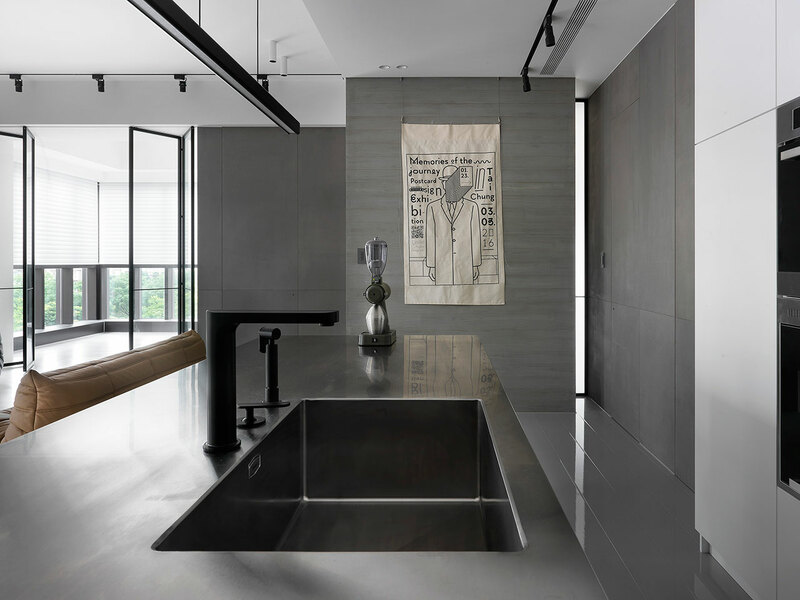 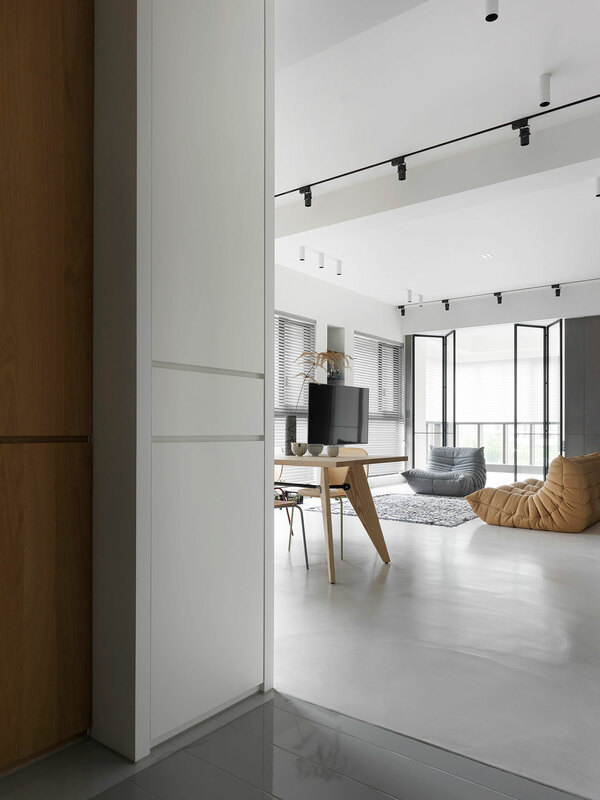 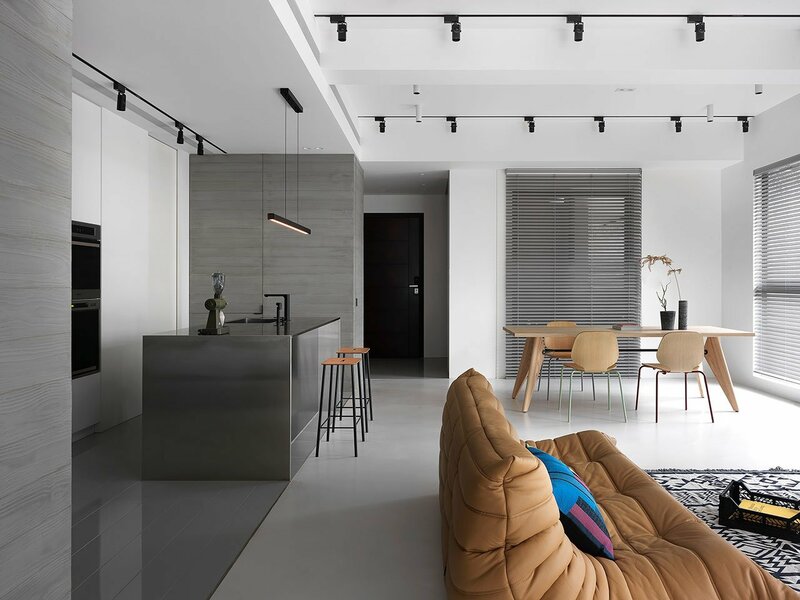 Reflecting the unique lifestyle and sharp aesthetic of its new owner, this recently renovated apartment in Hsinchu city, Taiwan, has been designed by Taiwanese studio 2BOOKS space design as a haven of understated elegance and contemporary minimalism. 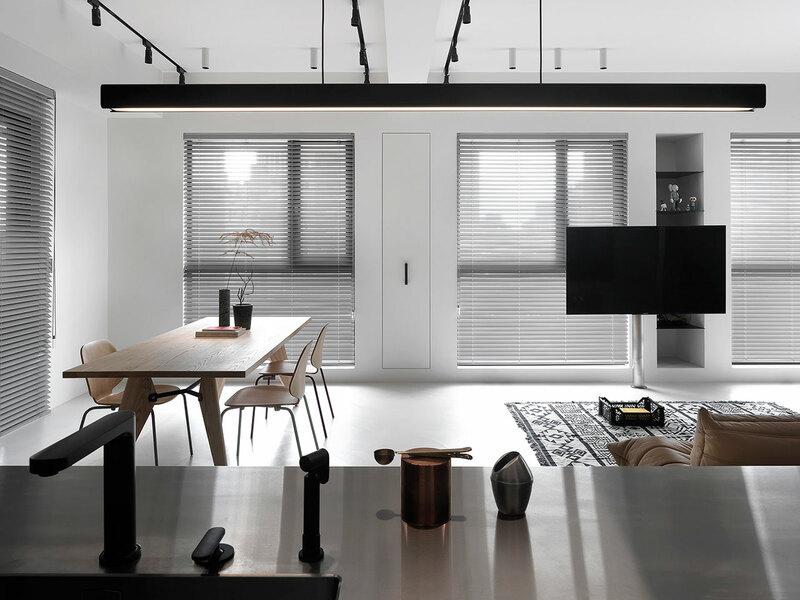 The apartment’s layout is centred on an airy, open-plan living room, softly illuminated by the abundant daylight that is filtered in through the three tall windows. 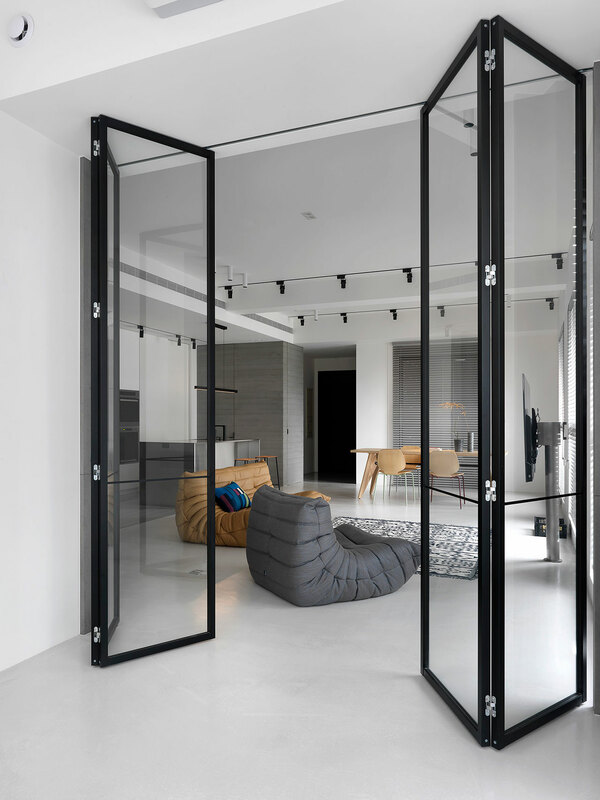 The space, which incorporates a lounge, dining area and an open kitchen, can be further expanded by opening a pair of folding glass doors that lead into a greenhouse, which is actually a converted bedroom that the apartment’s new owner didn’t have any use for, which is also an additional source of diffuse daylight. 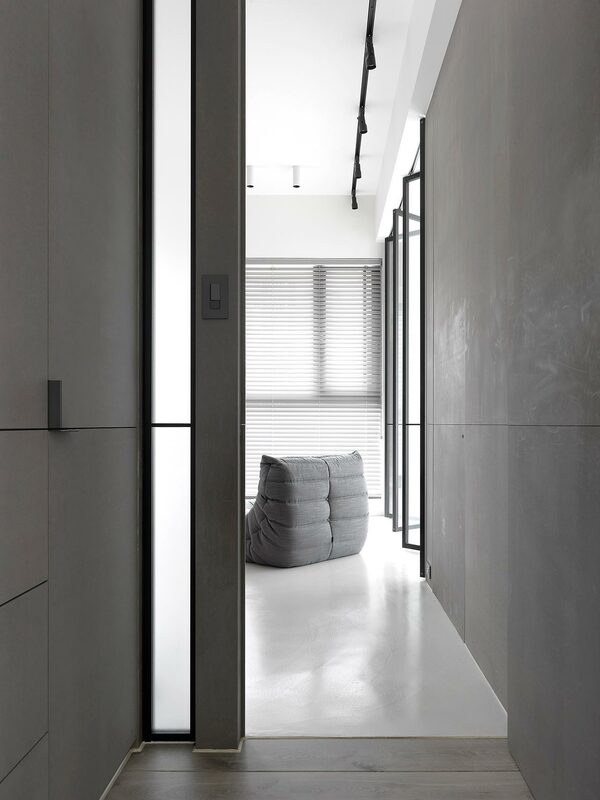 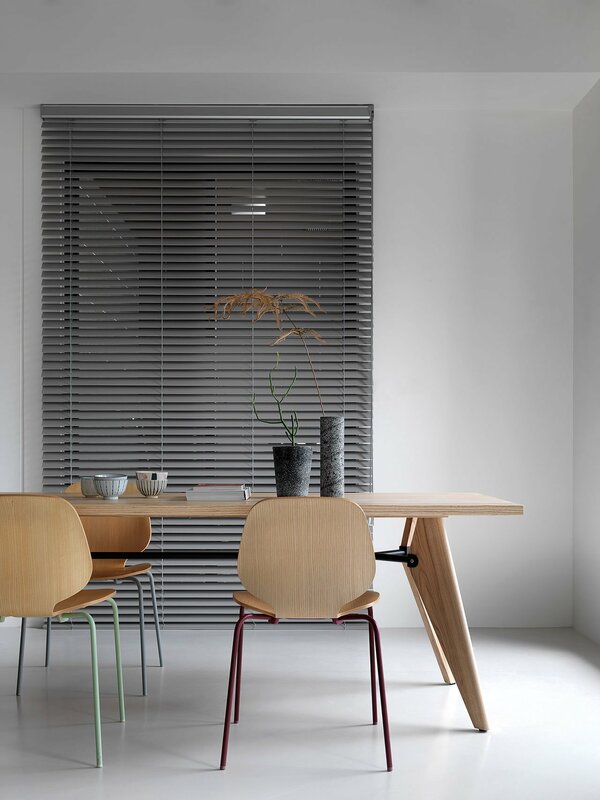 The interior design is characterized by clean, sharp lines and a colour palette, that apart from white, can only be described as a symphony of greys; the designers have strategically used different shades and textures of greys to differentiate between areas and establish a more visually stimulating environment. 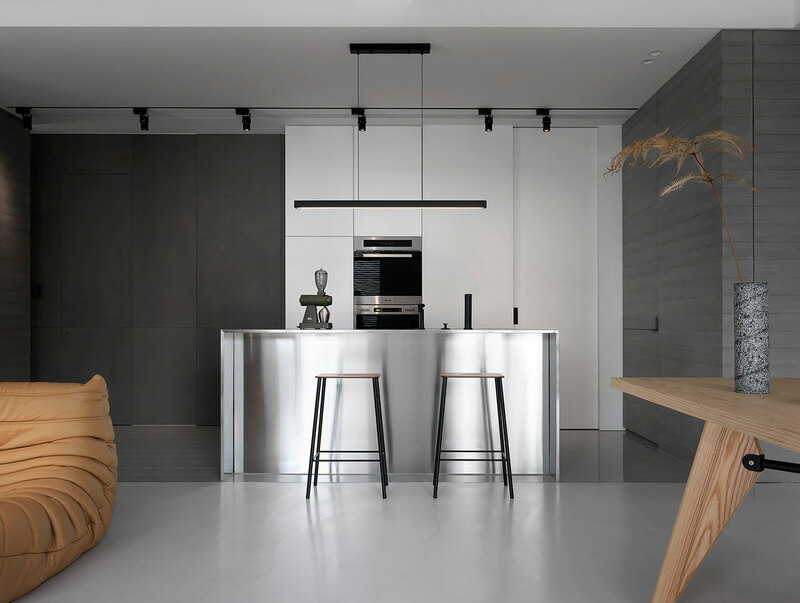 Thus, the kitchen area is delineated by darker shades of grey on the floor tiling and the wood grain cement walls on either side, whereas the rest of the living room is embraced by white walls and light grey concrete flooring that extends to the greenhouse. 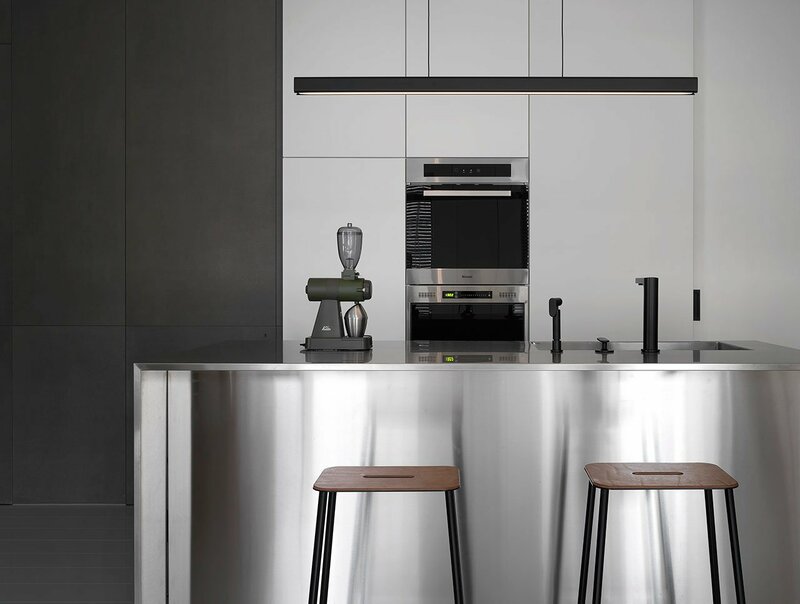 The stainless steel kitchen island provides a glossier tone to the otherwise more subdued grey finishes. 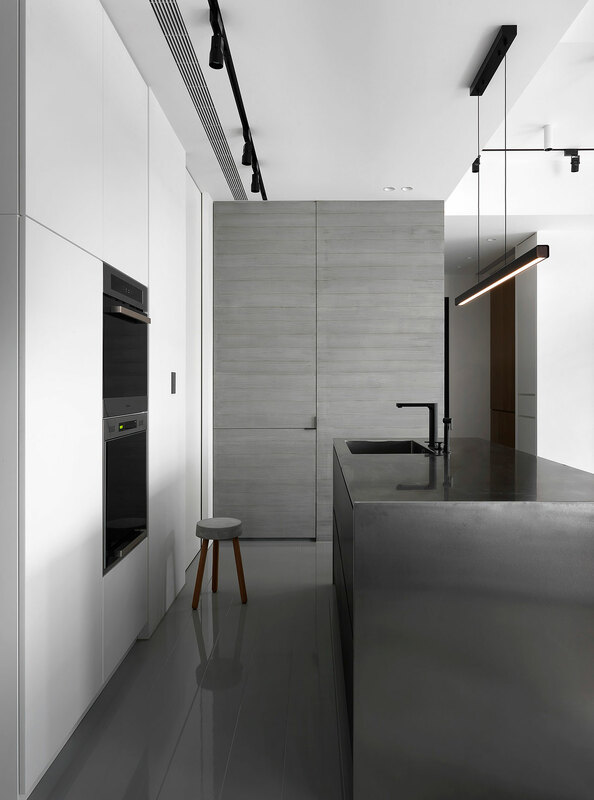 The white and grey setting is punctuated by black linear details such as the track spotlights, the kitchen pendant and the metal frames of the folding glass doors, which bring the space “into focus”. 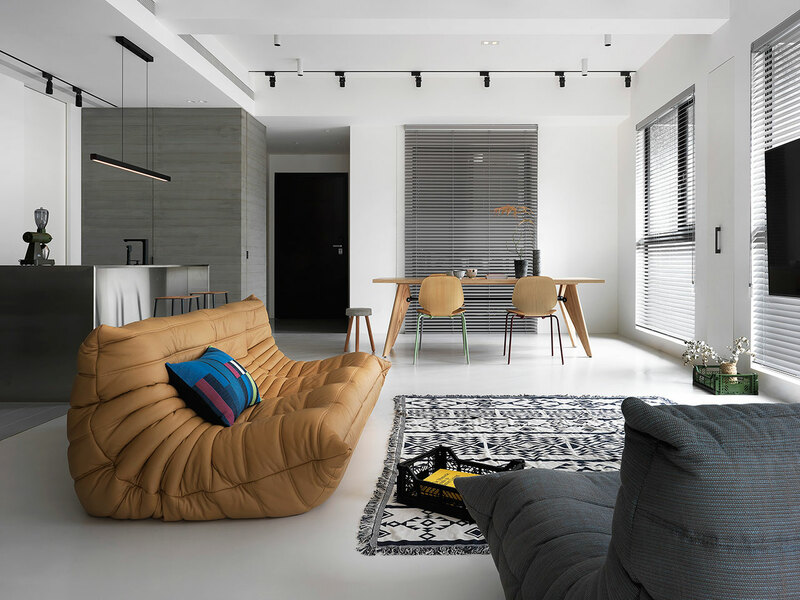 At the same time, the warmer tones of the tan sofa and the wooden dining furniture provide a respite from the monochrome palette without diluting it. 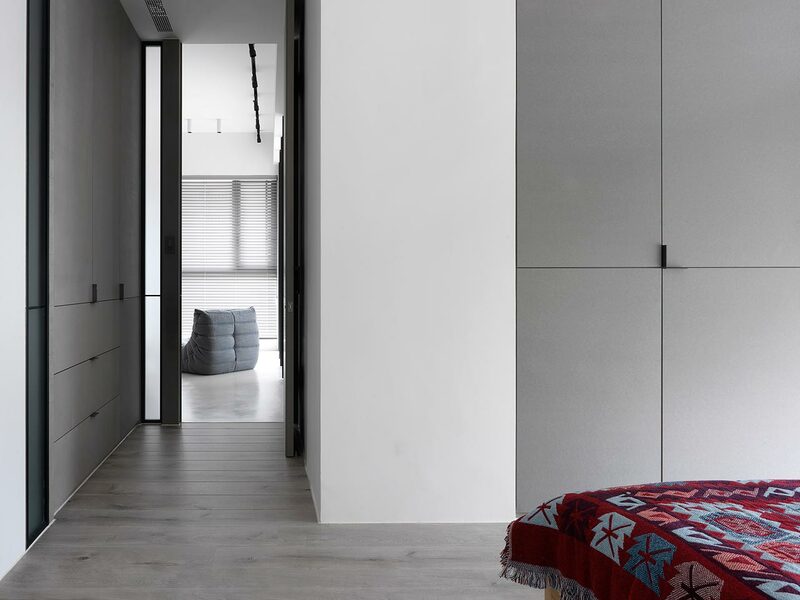 Similarly in the bedroom, the light grey shades of the wooden floor and the wardrobes create - along with the white walls - a tranquil ambience that is spiced up by the bed’s red-hued patterned cover (alluding perhaps to the bed’s hearth-like qualities). 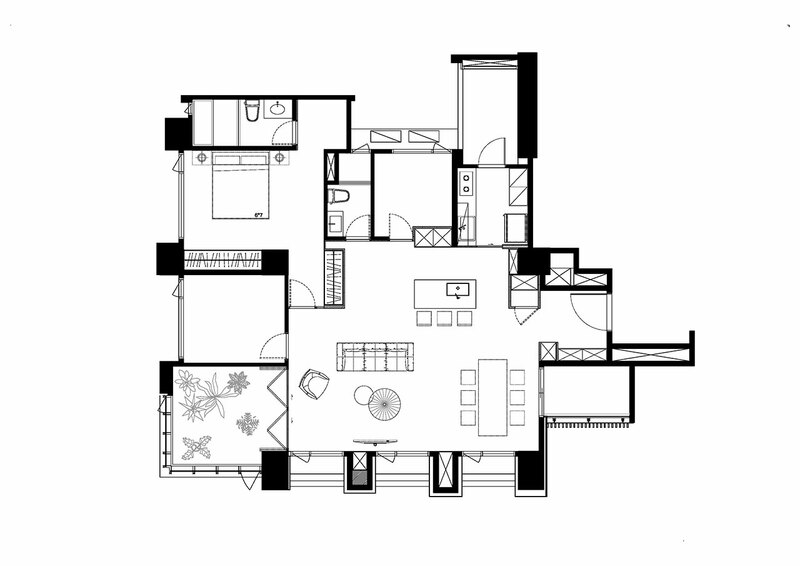 Plan © 2BOOKS space design.